This is one of my favorite nail products ever. In the winter my cuticles are a mess and my nails start to peel as soon as the temperature dips below 40 degrees. I have done enough manicures in my life to honestly not enjoy sitting in a nail salon for 35 minutes, and at $30 if you have them done monthly that is $360 a year. That is roughly 3 new pairs of shoes. This is where One Minute Manicure comes in. 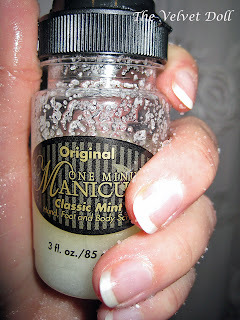 I apply this weekly to my hands and feet, file, apply clear polish, and voilà ~ manicure! Many similar hand products contain mineral oil because it is less expensive to use (compared to essential oils). Mineral oil does not penetrate the skin though - it just sits on top of the skin. One Minute Manicure contains many essential oils such as walnut, apricot, and jojoba, that penetrate the skin and moisturize. It also contains only Dead Sea salt which has 9 times the mineral content of ocean salt and acts as a natural exfoliant. It is around $15 for 3oz with shipping. 3oz lasts me about a month, but as I said I use it on my hands and my feet. Larger sizes are available. Omg I love the nail job! It's beautiful! I'm gonna be a manicurist just as soon as I finish my training so I might just have to try this one out myself! I'm going to school for it at Empire Beauty School, it's so much fun and so interesting! For all you gals out there who don't believe in your ability to make it big, I'm telling ya GO DO IT! I can't wait, I'm gonna be making so much money! At least according to this site: http://www.kaycircle.com/index.php?q=How-much-does-a-manicurist-make. Does anyone know if this is really how much they make? I really hope it is! !